I’ve always preferred to surround myself with art and unique products so I was very excited when Redbubble asked me to share some of my favorite products in a holiday gift guide. 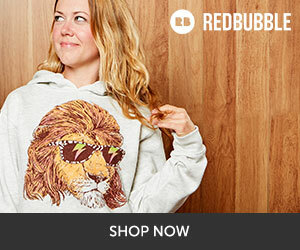 Redbubble gives independent artists a way to sell their creations on a variety of products like clothing, home decor, and accessories. I’m always impressed with the quality and print of the products I have. You can find just about anything to fit your interests and add unique products to your home. I know how overwhelming it can be to search through thousands of products, but lucky for you, I really enjoy the hunt. Also, be sure to check out the other products available as there are lots of different options available for each piece of art. Hope you enjoy my finds! Be sure to check out the other art from each of these artist for more great products for anyone on your holiday gift list.